So if all goes well, I will be leaving Friday for Antarctica. I don't yet have the time of the flight, nor anything packed, but I know what's going, and it shouldn't be to painful. I hope to find a digital camera to bring, of course. I will be travelling with my netbook. Charleston Airport to LAX to Auckland, New Zealand to Christchurch, NZ. I should spend two nights in Christchurch. I will get issued my cold weather gear there. They're about 17 hours ahead of the Eastern USA. We'll use their timezone on the ice. 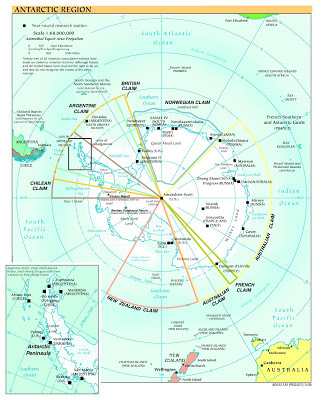 After all this I should end up at McMurdo Station, on Ross Island in New Zealand's claim of Antarctica on October 5th. Below is a very good map I found of the region. It's not legible without viewing full size though, sorry. McMurdo station is a little over 800 miles from the South Pole, and much warmer ;) It may look like the two stations there are in the water, or on the ice shelve, but they're actually firmly on real land -- Ross Island. As far as I know, it's connected year round to the mainland though by ice.